A superyacht owner who cares deeply for the heritage of classic marques – yet is also to be found regularly risking his life in the water? As Stewart Campbell discovers, racing car driver and owner of 1952 Feadship yacht Anahita V Chapman Ducote is an enviable study in contrasts. No one can make you feel inadequate quite like superyacht owner Chapman Ducote. 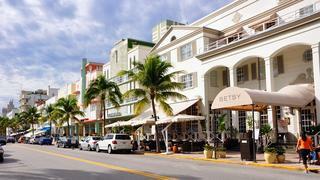 If it was just the house on South Beach in Miami, the successful business employing 500 people, and the beautiful author wife, I could just about stomach it. But there’s more: in his spare time this tanned native of New Orleans gets into the boat at the end of his garden and blasts to the Bahamas to go spear-fishing and free-dive. He also snowboards, and is a regular visitor to the podium in the various race-car series he’s involved in. Then there are his charitable works, his seat on the board of the Miami Symphony Orchestra and his patronage of a well-respected Florida art museum. I bet he even plays the guitar. Ducote, at just 38, is a walking, talking motivational slogan, and when we meet at the Fort Lauderdale Boat Show, it is impossible not to be utterly tractor-beamed by his affable, easy-going nature. I don’t want to interview him; I want to go grab a beer with him. And then go spear-fishing. Unfortunately, he’s got work to do. He’s at the show with Sweden’s Delta Powerboats, for which he’s recently become the US importer. Deltas represent the cutting edge in yacht design – razor sharp and made completely of carbon for exceptional performance and efficiency. 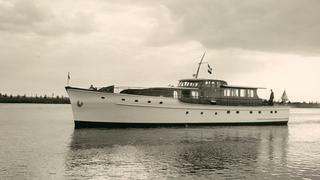 But while undoubtedly cool, the boat I’m here to talk about is the polar opposite of these futuristic Swedes; Ducote is also the proud owner of 24.69 metre Anahita V, the biggest Feadship ever when she was launched in 1952, and the very first yacht from the company to be imported into the US. 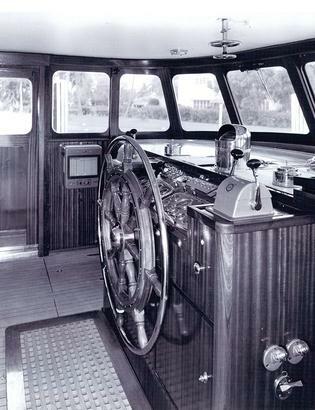 Ducote found the yacht completely by chance, sitting anonymously in a California boatyard. “It’s kind of a funny story,” Ducote says. “My wife does most of her writing on boats, and while we live on the water, she can’t write a word at home. So she told me she wanted an old tugboat that we could put at the end of the garden to act as a writing studio and guest house. A racing Rolls-Royce with a shady past, that is. Anahita V spent the first part of her US life cruising the East Coast, before her owner was lured to California by the sun and sparkling seas. There he sold her to a local, who cruised her between San Diego, southern California… and Mexico. “A lot. A little too much, if you know what I mean,” Ducote hints. 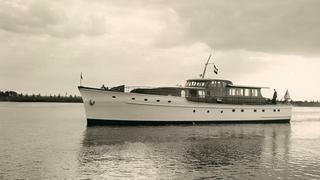 The owner was eventually indicted for smuggling and the Feadship became a ward of the state for years before being sold at auction in the 1980s to its next owner; he lived on board her for the next 30 years, until Ducote saw her mentioned in the chat room. Somehow he even finds time to act as the US agent for Delta Powerboats, and it’s one of that company’s models, the triple IPS-powered, all-carbon 54 that he’s got sitting at the end of his South Beach garden. He’s long desired to be in the boat business and despite the joy he gets from whipping a car around a racetrack at breakneck speeds, it’s really always been about the boats. “My first conscious memory is rolling around the saloon floor of a Hatteras sportsfish boat, which my father had at the time. There was a storm and I was looking through the back door. I couldn’t walk. I couldn’t speak. But I remember rolling around that floor,” he says. The experience clearly engendered some kind of desire to push the limits when it comes to water. In his weekend trips over to the Bahamas in his boat, he regularly dives for his lunch, speargun in hand. “It’s a challenge, mentally and physically,” he says. “You’re in an environment you’re not supposed to be in, combating currents and winds and fighting sharks – literally.” Sharks? “Yeah, it’s happened many times: I’ve had to hit sharks. You punch them in the nose, or use one of your spears and put it in their eye or gills or whatever. I never feel more alive than when I’m spear-fishing.” His hunting is done in about 18 metres of water, but he goes much deeper when he free-dives, his record being about 39 metres. This means he holds his breath for about a minute and a half. “Sometimes I go so deep I lose consciousness,” he says, deadpan. “That’s happened to me before. I had a friend who helped get me back. But it’s a cool sport. It takes a lot of training, a lot of fitness and a certain type of personality to want to do it.” It’s hard to reconcile this daredevil side of his personality with the desire to travel sedately at 12 knots on a 60-year-old classic in the Med, but part of Ducote’s charm is that there are no borders to his enthusiasm, no single stream that he swims in. It just makes him, irritatingly, that much more interesting.